“Opera” is set to be released on May 9th, while Eunhyuk and Donghae are set to reveal their Japanese version of “Oppa Oppa”on April 4th. Successfully kicking off their latest concert tour “Super Show 4” inSouth Korea, Japan and Taiwan, Super Junior flew to Singapore over the weekend to perform for their local fans. On the 18th and 19th of February, Super Junior performed at Singapore’s Indoor Stadium and was cheered by thousands of their enthusiastic fans. 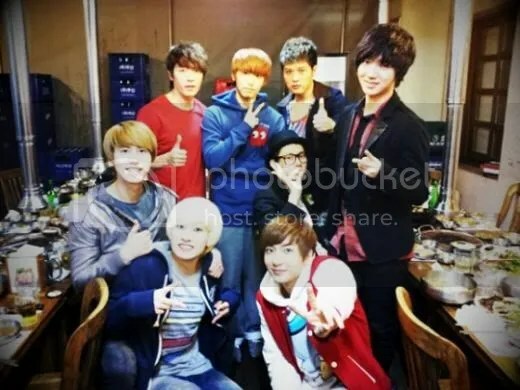 He also attached a photo of him, with Super Junior’s Yesung, Leeteuk, Kyuhyun, Donghae, Sungmin, and Shindong. Super Junior officially ended their promotions on Inkigayo last week. Super Junior’s Kyuhyun recruited CNBLUE’s Jonghyun to his infamous “Kyu-Line”. Using a phone application which detects celebrity lookalikes, Super Junior’s Kyuhyun revealed his surprise upon receiving an update from CNBLUE’s Jonghyun. Following a sequence of three comeback stages on Music Bank, Music Core, and Inkigayo last week, Super Juniorperformed their final comeback stage this week on M! Countdown. They performed “A-Cha” on Music Bank, then celebrated Huh Gak’s win that night by ceremoniously lifting him up. The next night on Music Core, Yesung, Eunhyuk, and Shindong performed what was originally Heechul’s part in a duet of “Breakups Are So Typical Of Me” with Kim Janghoon. The whole group came together to perform “A-Cha” at the end of Music Core, and on the next night’s Inkigayo as well. Super Junior performed “Oops!” on KBS 2TV’s “Yoo Heeyeol’s Sketchbook”, featuring SNSD’s Tiffany performing f(x)’s part.